For about 30 seconds all up. 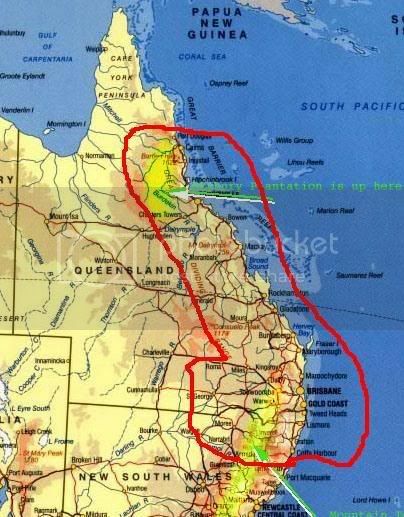 Texas, Queensland(see the red arrow and smiley face), couple of hundred km’s from where I live(Brisbane). About 500 people, not so good for a screenwriting expo’s I imagine. Been absolutely flat out, managed to get some writing done on the joint project but none on mine, although with the driving I have been doing lately(racked up 2500km last week) I have had time to run plenty of scenarios through the old think wagon and have come up with a few ideas to improve both screenplays, so that’s good. I tend to help this process along by downloading and burning onto a CD the CS podcasts, great company when all you are left with is ABC radio and about 4 hours of driving ahead. I put the question out there a while ago about software for converting and burning mp3’s to a CD, discovered Windows Media does that itself. I knew it ripped but was not aware it converted…..so there you go. Saved me plenty of time. Along with half the western world got to see Transformers, enjoyed it for what it was, fun to see John Rogers name up there, hope he did not get to shafted in the whole Michael Bay film situation. Michael Bay is an enigma to me…..hmmmmmm I may be making that too complex. I have read things, as we all have about MB, however, I have found a number of his films(not all) enjoyable – for what they are. No, they are not wildly thought provoking, etc. They are however, generally entertaining in that big screen, action, summer blockbuster way. Someone in the scribosphere once wrote that the average movie goer is tired from the week at work and wants to escape, hence the reason for dumbing down movies(I could be a little wrong in the wording, it was a while ago). I think they are right for the first part, but I don’t see it as dumbing down so much as just making it entertaining….if you can entertain and educate(that includes making people think about a situation), bloody well done, if all you can do is entertain, then well done! Finally saw the Da Vinci Code the other week. Neither my wife and I had read the book so we were going in knowing the basic spoiler, but still keen to see this movie. Lasted 20 minutes before we turned it off. I kinda thought it was going downhill when the priest was whipping himself and I was thinking, not as painful as where I’m sitting mate. We could not waste our time waiting to see if Tom Hanks cut his hair or changed his expression, there was sleeping to be done! It really did not entertain us at all and therefore lost us. Hey, I’ll watch a doco about flies crawling up a wall if you make it interesting and educational. Going to be home for a number of weeks now so will have a chance to catch up on a number of things, jobs, writing, work, etc. which will also allow me to post a bit more regularly. Stop laughing. Parents situation is in flux. Dad has moved back home but it is day by day stuff. Must admit, did not think he was going back. Happened once twenty years ago(like I said, huge backstory, but no violence towards each other at all, nothing like that) but I knew then he would go back, but did not expect it this time. Not sure if I am happy he has moved back...hmmmm. Time will tell if it is a good move. Take care and again congrats to all the people like Fun Joel, Chris etc that have been picking up writing gigs lately, well done! Cool map. Interesting turf you trod! I only just noticed, my little red outline does seem to resemble a certain male body part, but I could just be channelling Freud.